Nearby emission line galaxies NCG 4038 – 4039. The pink parts in this image are showing the light from the gas heated by newly formed stars. Credit: NASA, ESA and The Hubble Heritage (STScl/AURA)-ESA/Hubble Collaboration. New research has provided a deeper insight into emission line galaxies, used in several ongoing and upcoming surveys, to help us further understand the composition and fate of the Universe. The quest to determine the nature of both dark matter and dark energy has led scientists to adopt new tracers of the large-scale structure of the Universe, such as emission line galaxies. These galaxies present strong emission lines from the gas heated up by newly formed stars. Lead author of the study, Dr Violeta Gonzalez-Perez from the University’s Institute of Cosmology and Gravitation, said: “Galaxies are cosmic lanterns that show small patches of cosmic history, informing us of the changes in the space-time fabric of the Universe. The strong formation of new stars in galaxies leave a characteristic imprint in their spectra that allows for a precise determination of their distance. However, current emission line galaxy samples are small and their characteristics are not well understood. Computational modelling is the only way to attempt to understand all the processes involved in the formation and evolution of these galaxies. 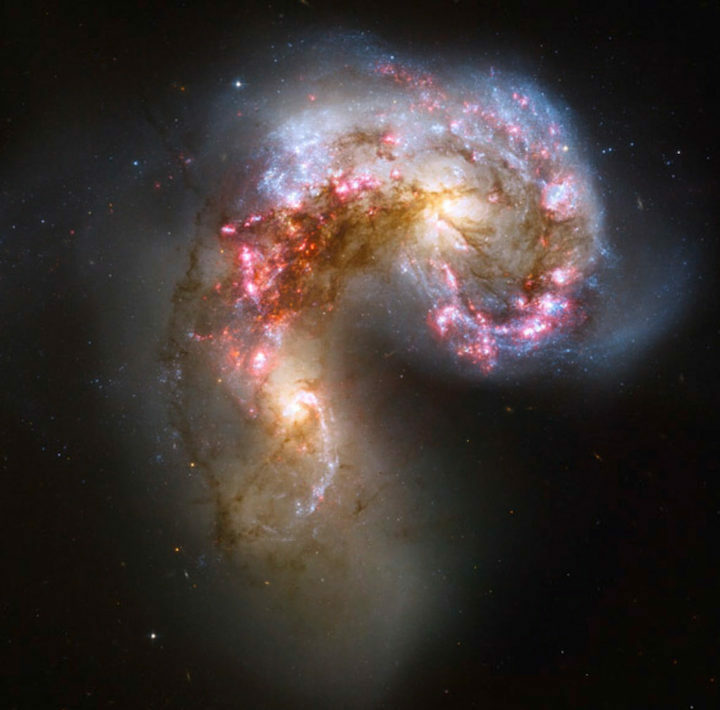 Astronomers from the the world-leading Institute of Cosmology and Gravitation (ICG) explored the characteristics of emission line galaxies through experiments on DiRAC’s (Distributed Research utilising Advanced Computing) national supercomputing facility at Durham University. The computational experiments were concentrated around the time when the Universe went from being matter dominated to becoming dark energy dominated as it is now. They found that most emission line galaxies live at the centres of gravitational potential wells, with masses equivalent to eleven billion of our suns. Current numerical models of formation and evolution of galaxies also show that emission line galaxies trace the underlying gravitational potentials in a different way to galaxies selected by their stellar mass. They then compared their results with the expectations from the SDSS-IV/eBOSS surveys and Dark Energy Spectroscopic Instrument (DESI). Both surveys aim to measure the effect of dark energy on the expansion of the Universe. Next summer, the SDSS-IV/eBOSS survey is expected to have the first cosmological results from these tracers. In the coming years, the Dark Energy Survey Instrument (DESI) will expand this usage of emission line galaxies as cosmological tracers. The DESI will see their first light in 2019 and it will measure the spectra of 35 million galaxies, which is eight times more than the current SDSS has proved. In 2021, Euclid will start collecting spectra for 50 million sources, solely focusing on emission line galaxies. The ICG is involved in both surveys. The study, which is published in the Monthly Notices of the Royal Astronomical Society (published by Oxford University Press), involved researchers from the Universities of Portsmouth and Durham (UK), the Max Planck Institute for Extraterrestrial Physics (Germany), the Pontifical Catholic University of Chile and Centro de Estudios de Física del Cosmos de Aragón (Spain).